King's Message to the Committees at York. Message to the H. C. for Conference about these Papers. L. Howard's Letter to the Speaker. Sir Philip Manwaring and L. Loftus. about a Declaration in Answer to the King's Proclamation about the Militia; and to sit P. M.
Conference about Papers from York reported. Desires of the H. C. at this Conference. Committee to consider of the Desires of the H. C.
Petitions of Yorkshire to the King and Parliament to be printed. Committee to consider of a Narrative to be printed with them. and for a Conference about the Ordinance for raising Men for the Sea Adventure. L. Coventry's Waggon to pass, but the Arms stayed. Message to the H. C. for the Particulars about L. Coventry. Narrative to be printed with the Yorkshire Petitions. All Business, except the Irish, deferred till the Proceedings at York are debated. Message to the H. C. for a further Conference. 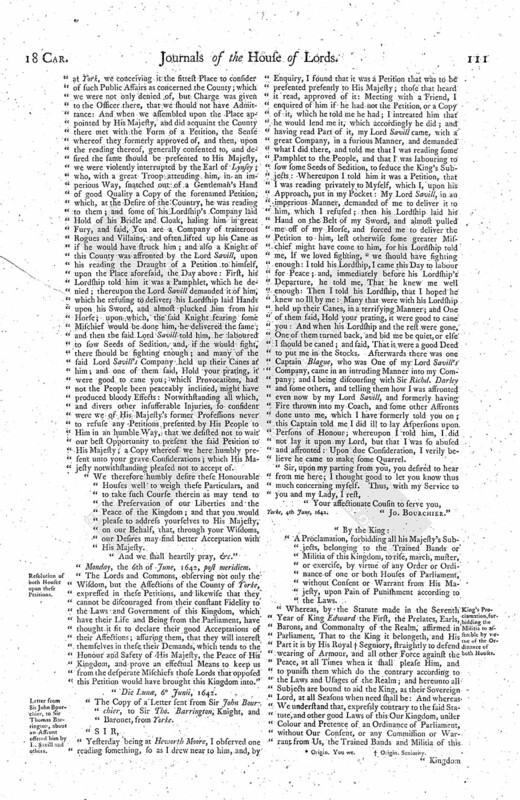 The Addition printed, with Yorkshire Petitions. Bedfordshire Militia to be put in Execution. Message from the H. C. for Committees to meet about the Yorkshire Business, and that Proceedings may be printed. Wm. 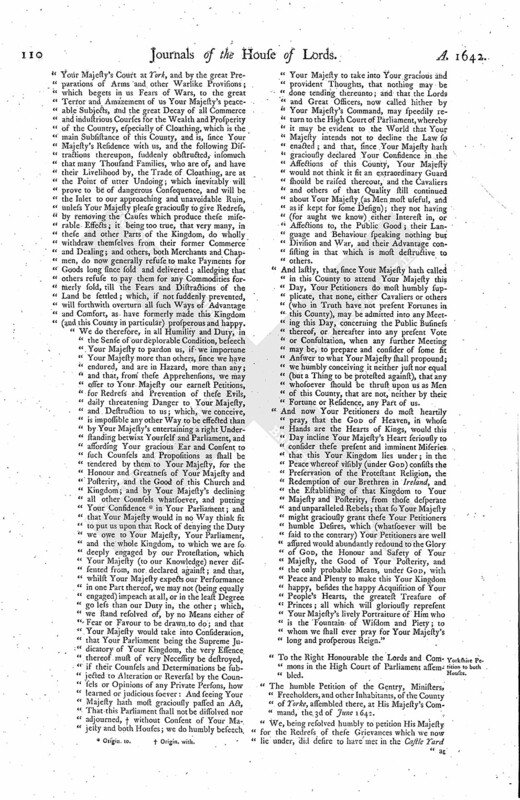 King's Information, who was sent to attach Beckwith. E. of Lindsey an Enemy to the State. York Petition to the King approved of. Petitioners thanked, and the King to be moved in their Behalf. 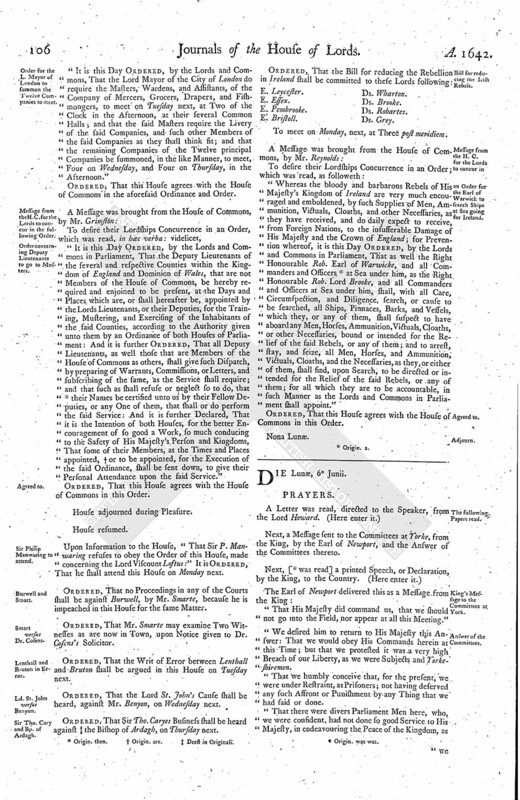 Petitions from York, and the Additions to be printed. York Petitioners to be satisfied. The King's Arms not to be carried to York. Narrative to be made of the Injuries offered the Messengers sent to attach Beckwith. Sir Joseph Bourchier's Letter to Sir Thomas Barrington to be printed. Committee to consider of the whole of this Conference. Yorkshire Petition to the King. Yorkshire Petition to both Houses. Resolution of both Houses upon these Petitions. Letter from Sir John Bourchier, to Sir Thomas Barrington, about an Affront offered him by L. Savill and others. 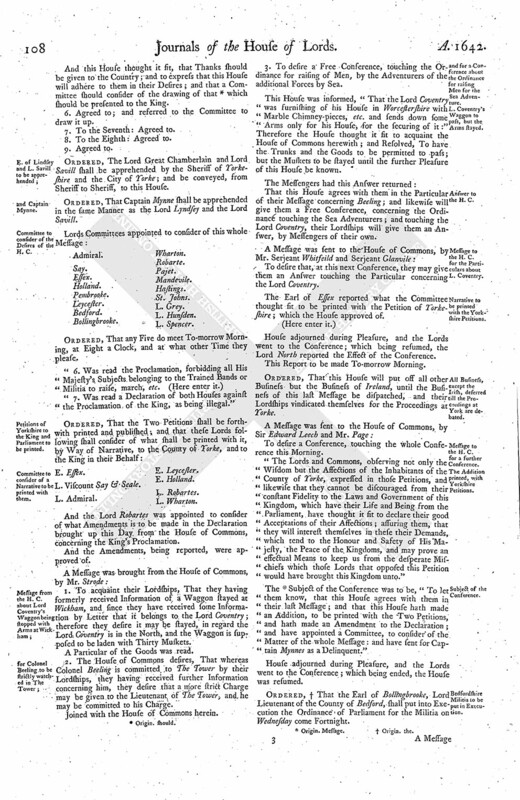 King's Proclamation, forbidding the Militia to assemble by virtue of the Ordinance of both Houses. Declaration of both Houses concerning this Proclamation. Declaration of 7 Edw. I. Next, a Message sent to the Committees at Yorke, from the King, by the Earl of Newport, and the Answer of the Committees thereto. "That His Majesty did command us, that we should not go into the Field, nor appear at all this Meeting." "We desired him to return to His Majesty this Answer: That we would obey His Commands herein at this Time; but that we protested it was a very high Breach of our Liberty, as we were Subjects and Yorkeshiremen. "That we humbly conceive that, for the present, we were under Restraint, as Prisoners; not having deserved any such Affront or Punishment by any Thing that we had said or done. "That there were divers Parliament Men here, who, we were confident, had not done so good Service to His Majesty, in endeavouring the Peace of the Kingdom, as we had; who were not only admitted to this Meeting, but had much Respect from His Majesty, while we suffered under these undeserved Injuries. "That though, for the present, We should stay from going thither, yet, if any Thing should happen wherein our Service might be required by our Instructions, we must and would be ready to come and perform it." The House Resolved, To communicate these to the House of Commons. To desire a Conference, by a Committee of both Houses, touching a Letter received from Yorke, and a printed Declaration of the King's, published at Yorke. The Speaker was appointed to read the Letter, and to acquaint them with the Declaration, and let them know, "That their Lordships are (fn. 2) of Opinion, and think it fit, that some Declaration, in Answer to the King's, be printed and dispersed through this Kingdom." "According to the Commands of the House, we presented your Petition and Propositions to the King, Yesterday Morning: He heard them read, and told us He would take Time to consider of an Answer. I doubt not but the House will expect from me an Account of the Great Meeting Yesterday; yet I do believe that no Man can fully satisfy to what it tended, or make any Judgement thereon, what Sense the Country had on it; for as nothing was offered to them by Way of Proposition, so nothing was said by them, only that divers Times there was made a very great Shout or Noise: A printed Speech there was read, in divers Places of the Field, which some heard; but many Thousands went away, saying they could give no Account of the Cause of their being called together. The Number was very great, thought to be about Forty Thousand. The King came to the Place, with the Prince, the Duke of York, the Prince Elector, most of the Lords that are in Town, the Regiment of Trained Bands, His Guard of Horse of this County, His own Servants, and the Soldiers that are about the Town; with whom He rid about the Field, stayed a little; and so departed. A Petition was offered to His Majesty, by Sir Tho. Fairefax, in the Name of many of these Inhabitants of this County; but it was not accepted. There were but few of the Gentlemen at this Meeting, excepting those who have put themselves upon the King's Guard; this Summons being intended by His Majesty only for the Ministers, Freeholders, Copyholders, and Farmers. We continue still to suffer by the King's Displeasure; for, when we were ready to take Horse, and accompany our Countrymen, it pleased His Majesty to send the Earl of Newport to us with a Message, which, because I would give you punctually, I have set it down in a Paper, which I have sent here inclosed, and likewise our Answer which we returned by him to His Majesty: This Answer we resolved to make, and to stay at our Lodgings; the Place of the Meeting being very near, and divers of our Servants there, who we directed to give us particular Notice of what passed; so that, if there had been Occasion, we could presently have been upon the Place, to have done any Thing which had concerned our Duties. Yorke, 4th of June, 1642. "To the Right Honourable the Speaker of the House of Peers for the Time being." That the House of Commons will return an Answer to the Message, by Messengers of their own, in convenient Time. Ordered, That Sir Phillip Manwaringe shall seal such Assurances to the Lord Viscount Loftus, as he ought to do by virtue of the Order of this House, by Saturday next. 1. They will give a Conference, as their Lordships have desired. 2. They desire, at the same Time, a Conference touching some Letters and Intelligence as they have received from Yorke. 3. That (fn. 3) they desire to offer, at this Conference, a Declaration in Answer to the King's Proclamation concerning the Militia. 4. The House of Commons desires their Lordships to sit this Afternoon. That this (fn. 4) House agrees with the House of Commons in all the Particulars of this Message. The Lord North was appointed to be Speaker this Afternoon. "1. They presented to their Lordships a Petition of the County of Yorke, which the King refused from the County. "2. Next, was read a Petition of the Gentry, etc. of the County of Yorke to the Parliament. "3. Was read a Letter of Sir John Bourchier to Sir Thomas Barrington. "4. Was read the Deposition of Wm. Kinges. "5. Next, was read the Resolutions of the House of Commons. "The Desires of the House of Commons was, to join in these Votes, and that their Lordships would send for the Two Lords; videlicet, The Lord Great Chamberlain (fn. 5) "
To the First: Agreed to. To the Second: Agreed to. To the Third: Agreed to. And this House thought it fit, that Thanks should be given to the Country; and to express that this House will adhere to them in their Desires; and that a Committee should consider of the drawing of that (fn. 6) which should be presented to the King. 6. Agreed to; and referred to the Committee to draw it up. 7. To the Seventh: Agreed to. 8. To the Eighth: Agreed to. Ordered, The Lord Great Chamberlain and Lord Savill shall be apprehended by the Sheriff of Yorkeshire and the City of Yorke; and be conveyed, from Sheriff to Sheriff, to this House. Ordered, That Captain Mynne shall be apprehended in the same Manner as the Lord Lyndsey and the Lord Savill. Ordered, That any Five do meet To-morrow Morning, at Eight a Clock, and at what other Time they please. "7. Was read a Declaration of both Houses against the Proclamation of the King, as being illegal." And the Lord Robartes was appointed to consider of what Amendments is to be made in the Declaration brought up this Day from the House of Commons, concerning the King's Proclamation. And the Amendments, being reported, were approved of. 1. To acquaint their Lordships, That they having formerly received Information of a Waggon stayed at Wickham, and since they have received some Information by Letter that it belongs to the Lord Coventry; therefore they desire it may be stayed, in regard the Lord Coventry is in the North, and the Waggon is supposed to be laden with Thirty Muskets. A Particular of the Goods was read. 2. The House of Commons desires, That whereas Colonel Beeling is committed to The Tower by their Lordships, they having received further Information concerning him, they desire that a more strict Charge may be given to the Lieutenant of The Tower, and he may be committed to his Charge. Joined with the House of Commons herein. 3. To desire a Free Conference, touching the Ordinance for raising of Men, by the Adventurers of the additional Forces by Sea. This House was informed, "That the Lord Coventry was furnishing of his House in Worcestershire with Marble Chimney-pieces, etc. and sends down some Arms only for his House, for the securing of it:" Therefore the House thought it fit to acquaint the House of Commons herewith; and Resolved, To have the Trunks and the Goods to be permitted to pass; but the Muskets to be stayed until the further Pleasure of this House be known. That this House agrees with them in the Particular of their Message concerning Beeling; and likewise will give them a Free Conference, concerning the Ordinance touching the Sea Adventurers; and touching the Lord Coventry, their Lordships will give them an Answer, by Messengers of their own. To desire that, at this next Conference, they may give them an Answer touching the Particular concerning the Lord Coventry. The Earl of Essex reported what the Committee thought fit to be printed with the Petition of Yorkeshire; which the House approved of. House adjourned during Pleasure, and the Lords went to the Conference; which being resumed, the Lord North reported the Effect of the Conference. This Report to be made To-morrow Morning. Ordered, That this House will put off all other Business but the Business of Ireland, until the Business of this last Message be dispatched, and their Lordships vindicated themselves for the Proceedings at Yorke. To desire a Conference, touching the whole Conference this Morning. "The Lords and Commons, observing not only the Wisdom but the Affections of the Inhabitants of the County of Yorke, expressed in those Petitions, and likewise that they cannot be discouraged from their constant Fidelity to the Laws and Government of this Kingdom, which have their Life and Being from the Parliament, have thought it fit to declare their good Acceptations of their Affections; assuring them, that they will interest themselves in these their Demands, which tend to the Honour and Safety of His Majesty, the Peace of the Kingdoms, and may prove an effectual Means to keep us from the desperate Mischiefs which those Lords that opposed this Petition would have brought this Kingdom unto." The (fn. 7) Subject of the Conference was to be, "To let them know, that this House agrees with them in their last Message; and that this House hath made an Addition, to be printed with the Two Petitions, and hath made an Amendment to the Declaration; and have appointed a Committee, to consider of the Matter of the whole Message: and have sent for Captain Mynnes as a Delinquent." Ordered, (fn. 8) That the Earl of Bollingbrooke, Lord Lieutenant of the County of Bedford, shall put into Execution the Ordinance of Parliament for the Militia on Wednesday come Fortnight. To let their Lordships know, that the House of Commons agrees in the Amendments and Additions now sent down; and that they have appointed a Committee of their House, to join with a Committee of Lords, to consider of the whole Message brought up this Day, concerning the Business of Yorke; and the House of Commons desires their Lordships to join with them, that they may be printed and published. "The Information of Wm. Kinge, the Messenger, that (fn. 9) was sent to attach Beckwith. "1. That the Warrant was against the Petition of Right; for every Warrant ought to express the Cause wherefore he is sent for. "2. If it were for his being a Recusant, he should answer for it in this Country. "3. If it were for any other Delinquency (which He did partly imagine what it was), when the House of Commons would do Him Justice against Sir Jo. Hotham, then He would do them Justice against Beckwith. "He further asked me, if I had any more Warrants to serve there." "The House of Commons had received further Information, That, on Thursday last, at Two a Clock in the Afternoon, a Messenger from the Parliament arrested one Mr. Beckwith, a Papist, who lives about Beverly (the Actor, with his Son-in-Law, to have Hull delivered to the King): The Messenger was thrown down a Pair of Stairs by one Captain Myn; at the Bottom he was kicked by many others; and it is thought would (fn. 10) have been slain, if the Lord Howard and Sir Phillip Stapleton had not presently come, who charged the Constables to raise Aid, and carried him and the Messengers to the Court, and did let His Majesty know all: The King did release Beckewith, and committed the Messengers to His Guard's safe keeping. "That this House doth declare the Earl of Lyndsey to be a Public Enemy to the State, and an Incendiary between the King and His People." "2. That this House doth declare the Lord Savill to be a Public Enemy to the State, and an Incendiary between the King and His People." "3. That this House doth approve of this Petition from the Gentry, Ministers, and Freeholders of the County of Yorke, endeavoured to be presented unto His Majesty the 3d of June last." Agreed to; and this House thought it fit that Thanks should be given to the Country; and to express, "That this House will adhere to them in their Desires;" and that a Committee of both Houses (fn. 11) be appointed, to consider of the drawing up something to be presented to the King, in their Behalf. "4. That this Petition from the Gentry, Ministers, and Freeholders of the County, and the Petition to both Houses, and the Narrative of the Endeavours to present it to His Majesty, be printed and published." Ordered, That this House agrees to this Vote. "5. 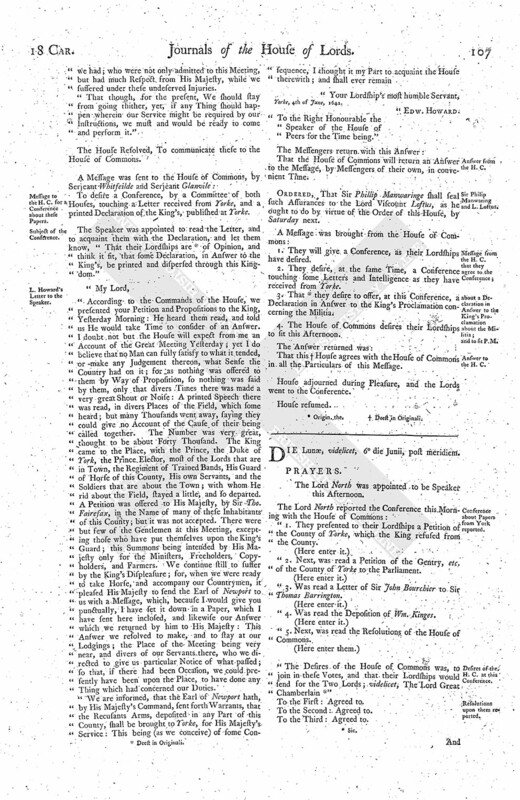 That the Lords be moved, to join with the House of Commons, in some fit Way of the satisfying the Desires of the Gentry, Ministers, and Freeholders, of the County of Yorke, expressed in their Petition concerning the Preservations of their Liberties and the Peace of the Kingdom, and for the procuring an Acceptance from His Majesty of their Petition." "6. That some Course may be taken, to prevent the carrying of the King's Arms to Yorke." Agreed; and referred to the Committee to draw it up. "7. That a Narrative be made of the Injuries offered unto the Messenger of the House of Commons, in the apprehending of Mr. Beckwith, a Recusant." "8. That the Letter sent to Sir Thomas Barrington, from Sir John Bourcher, be read at this Conference; and that the Letter be printed." "9. That a Committee of both Houses be appointed, to consider what is fit to be done upon the whole Matter represented at this Conference." "That this particular County (most affectionate to Your Majesty's Service) hath willingly, for Three Years last past, been the Stage whereon the Tragical Miseries, which necessarily accompany War and Armies, have been represented and acted, whereby the general Wealth and Plenty of this County is exhausted, and brought very low; which Weight of Miseries are sensibly become much more heavy, by Reason of Your Majesty's Distance in Residence, and Difference in Counsels, from Your Great Council the Parliament, begetting great Distempers and Distractions throughout the Kingdom, and have especially amongst us produced Factions and Divisions, drawing to these Parts great Numbers of discontented Persons, that, may too justly be feared, do affect the Public Ruin for their private Advantage; all which Evils are daily somented, and grown more formidable, by Your Majesty's drawing together (as we conceive, not according to Law) many Companies of the Trained Bands, and others, both Horse and Foot, of this County, and retaining Multitudes of Commanders and Cavaliers from other Parts, and by the daily Resort of Recusants, and Persons disaffected in Religion, to Your Majesty's Court at York, and by the great Preparations of Arms and other Warlike Provisions; which begets in us Fears of Wars, to the great Terror and Amazement of us Your Majesty's peaceable Subjects, and the great Decay of all Commerce and industrious Courses for the Wealth and Prosperity of the Country, especially of Cloathing, which is the main Subsistance of this County, and is, since Your Majesty's Residence with us, and the following Distractions thereupon, suddenly obstructed, insomuch that many Thousand Families, who are of, and have their Livelihood by, the Trade of Cloathing, are at the Point of utter Undoing; which inevitably will prove to be of dangerous Consequence, and will be the Inlet to our approaching and unavoidable Ruin, unless Your Majesty please graciously to give Redress, by removing the Causes which produce these miserable Effects; it being too true, that very many, in these and other Parts of the Kingdom, do wholly withdraw themselves from their former Commerce and Dealing; and others, both Merchants and Chapmen, do now generally refuse to make Payments for Goods long since sold and delivered; alledging that others refuse to pay them for any Commodities formerly sold, till the Fears and Distractions of the Land be settled; which, if not suddenly prevented, will forthwith overturn all such Ways of Advantage and Comfort, as have formerly made this Kingdom (and this County in particular) prosperous and happy. "We do therefore, in all Humility and Duty, in the Sense of our deplorable Condition, beseech Your Majesty to pardon us, if we importune Your Majesty more than others, since we have endured, and are in Hazard, more than any; and that, from these Apprehensions, we may offer to Your Majesty our earnest Petitions, for Redress and Prevention of these Evils, daily threatening Danger to Your Majesty, and Destruction to us; which, we conceive, is impossible any other Way to be effected than by Your Majesty's entertaining a right Understanding betwixt Yourself and Parliament, and affording Your gracious Ear and Consent to such Counsels and Propositions as shall be tendered by them to Your Majesty, for the Honour and Greatness of Your Majesty and Posterity, and the Good of this Church and Kingdom; and by Your Majesty's declining all other Counsels whatsoever, and putting Your Confidence (fn. 12) in Your Parliament; and that Your Majesty would in no Way think fit to put us upon that Rock of denying the Duty we owe to Your Majesty, Your Parliament, and the whole Kingdom, to which we are so deeply engaged by our Protestation, which Your Majesty (to our Knowledge) never dissented from, nor declared against; and that, whilst Your Majesty expects our Performance in one Part thereof, we may not (being equally engaged) impeach at all, or in the least Degree go less than our Duty in, the other; which, we stand resolved of, by no Means either of Fear or Favour to be drawn to do; and that Your Majesty would take into Consideration, that Your Parliament being the Supreme Judicatory of Your Kingdom, the very Essence thereof must of very Necessity be destroyed, if their Counsels and Determinations be subjected to Alteration or Reversal by the Counsels or Opinions of any Private Persons, how learned or judicious soever: And seeing Your Majesty hath most graciously passed an Act, That this Parliament shall not be dissolved nor adjourned, (fn. 13) without Consent of Your Majesty and both Houses; we do humbly beseech Your Majesty to take into Your gracious and provident Thoughts, that nothing may be done tending thereunto; and that the Lords and Great Officers, now called hither by Your Majesty's Command, may speedily return to the High Court of Parliament, whereby it may be evident to the World that Your Majesty intends not to decline the Law so enacted; and that, since Your Majesty hath graciously declared Your Confidence in the Affections of this County, Your Majesty would not think it fit an extraordinary Guard should be raised thereout, and the Cavaliers and others of that Quality still continued about Your Majesty (as Men most useful, and as if kept for some Design); they not having (for aught we know) either Interest in, or Affections to, the Public Good; their Language and Behaviour speaking nothing but Division and War, and their Advantage consisting in that which is most destructive to others. "And lastly, that, since Your Majesty hath called in this County to attend Your Majesty this Day, Your Petitioners do most humbly supplicate, that none, either Cavaliers or others (who in Truth have not present Fortunes in this County), may be admitted into any Meeting this Day, concerning the Public Business thereof, or hereafter into any present Vote or Consultation, when any further Meeting may be, to prepare and consider of some fit Answer to what Your Majesty shall propound; we humbly conceiving it neither just nor equal (but a Thing to be protested against), that any whosoever should be thrust upon us as Men of this County, that are not, neither by their Fortune or Residence, any Part of us. "And now Your Petitioners do most heartily pray, that the God of Heaven, in whose Hands are the Hearts of Kings, would this Day incline Your Majesty's Heart seriously to consider these present and imminent Miseries that this Your Kingdom lies under; in the Peace whereof visibly (under God) consists the Preservation of the Protestant Religion, the Redemption of our Brethren in Ireland, and the Establishing of that Kingdom to Your Majesty and Posterity, from those desperate and unparalleled Rebels; that so Your Majesty might graciously grant these Your Petitioners humble Desires, which (whatsoever will be said to the contrary) Your Petitioners are well assured would abundantly redound to the Glory of God, the Honour and Safety of Your Majesty, the Good of Your Posterity, and the only probable Means, under God, with Peace and Plenty to make this Your Kingdom happy, besides the happy Acquisition of Your People's Hearts, the greatest Treasure of Princes; all which will gloriously represent Your Majesty's lively Portraiture of Him who is the Fountain of Wisdom and Piety; to whom we shall ever pray for Your Majesty's long and prosperous Reign." "To the Right Honourable the Lords and Commons in the High Court of Parliament assembled. "The humble Petition of the Gentry, Ministers, Freeholders, and other Inhabitants, of the County of Yorke, assembled there, at His Majesty's Command, the 3d of June 1642. "We, being resolved humbly to petition His Majesty for the Redress of these Grievances which we now lie under, did desire to have met in the Castle Yard at York, we conceiving it the fittest Place to consider of such Public Affairs as concerned the County; which we were not only denied of, but Charge was given to the Officer there, that we should not have Admittance: And when we assembled upon the Place appointed by His Majesty, and did acquaint the County there met with the Form of a Petition, the Sense whereof they formerly approved of, and then, upon the reading thereof, generally consented to, and desired the same should be presented to His Majesty, we were violently interrupted by the Earl of Lynsey; who, with a great Troop attending him, in an imperious Way, snatched out of a Gentleman's Hand of good Quality a Copy of the forenamed Petition, which, at the Desire of the Country, he was reading to them; and some of his Lordship's Company laid Hold of his Bridle and Cloak, haling him in great Fury, and said, You are a Company of traiterous Rogues and Villains, and often lifted up his Cane as if he would have struck him; and also a Knight of this County was affronted by the Lord Savill, upon his reading the Draught of a Petition to himself, upon the Place aforesaid, the Day above: First, his Lordship told him it was a Pamphlet, which he denied; thereupon the Lord Savill demanded it of him, which he refusing to deliver; his Lordship laid Hands upon his Sword, and almost plucked him from his Horse; upon which, the said Knight fearing some Mischief would be done him, he delivered the same; and then the said Lord Savill told him, he laboured to sow Seeds of Sedition, and, if he would fight, there should be fighting enough; and many of the said Lord Savill's Company held up their Canes at him; and one of them said, Hold your prating, it were good to cane you; which Provocations, had not the People been peaceably inclined, might have produced bloody Effects: Notwithstanding all which, and divers other insufferable Injuries, so confident were we of His Majesty's former Professions never to refuse any Petitions presented by His People to Him in an humble Way, that we desisted not to wait our best Opportunity to present the said Petition to His Majesty; a Copy whereof we here humbly present unto your grave Considerations; which His Majesty notwithstanding pleased not to accept of. "We therefore humbly desire these Honourable Houses well to weigh these Particulars, and to take such Course therein as may tend to the Preservation of our Liberties and the Peace of the Kingdom; and that you would please to address yourselves to His Majesty, on our Behalf, that, through your Wisdoms, our Desires may find better Acceptation with His Majesty. "And we shall heartily pray, &c."
"Monday, the 6th of June, 1642, post meridiem. "The Lords and Commons, observing not only the Wisdom, but the Affections of the County of Yorke, expressed in these Petitions, and likewise that they cannot be discouraged from their constant Fidelity to the Laws and Government of this Kingdom, which have their Life and Being from the Parliament, have thought it fit to declare their good Acceptations of their Affections; assuring them, that they will interest themselves in these their Demands, which tends to the Honour and Safety of His Majesty, the Peace of His Kingdom, and prove an effectual Means to keep us from the desperate Mischiefs those Lords that opposed this Petition would have brought this Kingdom into." "Die Lunæ, 6 Junii, 1642. "The Copy of a Letter sent from Sir John Bourchier, to Sir Tho. Barrington, Knight, and Baronet, from Yorke. "Yesterday being at Heworth Moore, I observed one reading something, so as I drew near to him, and, by Enquiry, I found that it was a Petition that was to be presented presently to His Majesty; those that heard it read, approved of it: Meeting with a Friend, I enquired of him if he had not the Petition, or a Copy of it, which he told me he had; I intreated him that he would lend me it, which accordingly he did; and having read Part of it, my Lord Savill came, with a great Company, in a furious Manner, and demanded what I did there, and told me that I was reading some Pamphlet to the People, and that I was labouring to sow some Seeds of Sedition, to seduce the King's Subjects: Whereupon I told him it was a Petition, that I was reading privately to Myself, which I, upon his Approach, put in my Pocket: My Lord Savill, in an imperious Manner, demanded of me to deliver it to him, which I refused; then his Lordship laid his Hand on the Belt of my Sword, and almost pulled me off of my Horse, and forced me to deliver the Petition to him, lest otherwise some greater Mischief might have come to him, for his Lordship told me, If we loved fighting, (fn. 14) we should have fighting enough: I told his Lordship, I came this Day to labour for Peace; and, immediately before his Lordship's Departure, he told me, That he knew me well enough: Then I told his Lordship, that I hoped he knew no Ill by me: Many that were with his Lordship held up their Canes, in a terrifying Manner; and One of them said, Hold your prating, it were good to cane you: And when his Lordship and the rest were gone, One of them turned back, and bid me be quiet, or else I should be caned; and said, That it were a good Deed to put me in the Stocks. Afterwards there was one Captain Blague, who was One of my Lord Savill's Company, came in an intruding Manner into my Company; and I being discoursing with Sir Richd. Darley and some others, and telling them how I was affronted even now by my Lord Savill, and formerly having Fire thrown into my Coach, and some other Affronts done unto me, which I have formerly told you on; this Captain told me I did ill to lay Aspersions upon Persons of Honour; whereupon I told him, I did not lay it upon my Lord, but that I was so abused and affronted: Upon due Consideration, I verily believe he came to make some Quarrel. 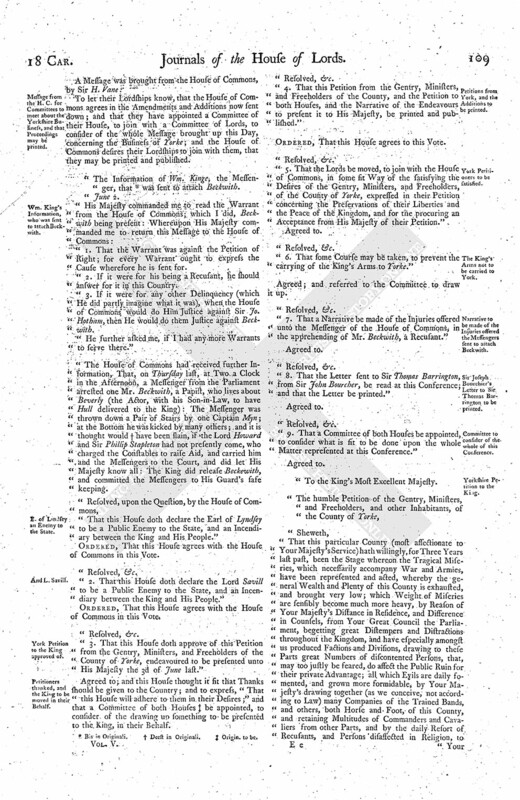 "A Proclamation, forbidding all his Majesty's Subjects, belonging to the Trained Bands or Militia of this Kingdom, to rise, march, muster, or exercise, by virtue of any Order or Ordinance of one or both Houses of Parliament, without Consent or Warrant from His Majesty, upon Pain of Punishment according to the Laws. "We do therefore, by this Our Proclamation, expressly charge and command all Our Sheriffs, and all Colonels, Lieutenant Colonels, Serjeant Majors, Captains, Officers, and Soldiers, belonging to the Trained Bands of this Our Kingdom, and likewise all High and Petty Constables, and other Our Officers and Subjects whatsoever, upon their Allegiance, and as they tender the Peace of this Our Kingdom, not to muster, levy, raise, or march, or to summon or warn, upon any Warrant, Order, or Ordinance, from one or both our Houses of Parliament (whereto We have not, or shall not, give Our express Consent), any of Our Trained Bands, or other Forces, to rise, muster, march, or exercise, without express Warrant under Our Hand, or Warrant from Our Sheriff of the County, grounded upon a particular Writ to that Purpose under Our Great Seal: And in case any of Our Trained Bands shall rise or gather together contrary to this Our Command, We shall then call them in due Time to a strict Account, and proceed legally against them, as Violators of the Laws, and Disturbers of the Peace of the Kingdom. "Given at Our Court at Yorke, the 27th Day of May, 1642." 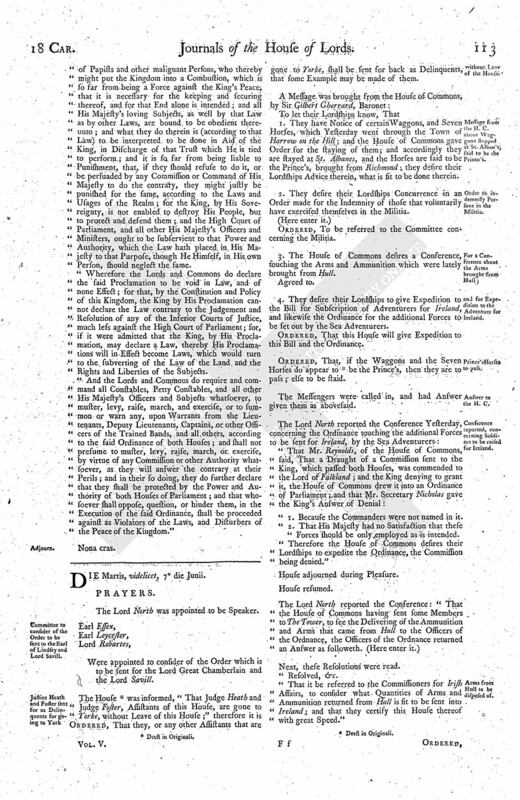 "A Declaration of the Lords and Commons in Parliament, concerning His Majesty's Proclamation, the 27th of May, 1642. 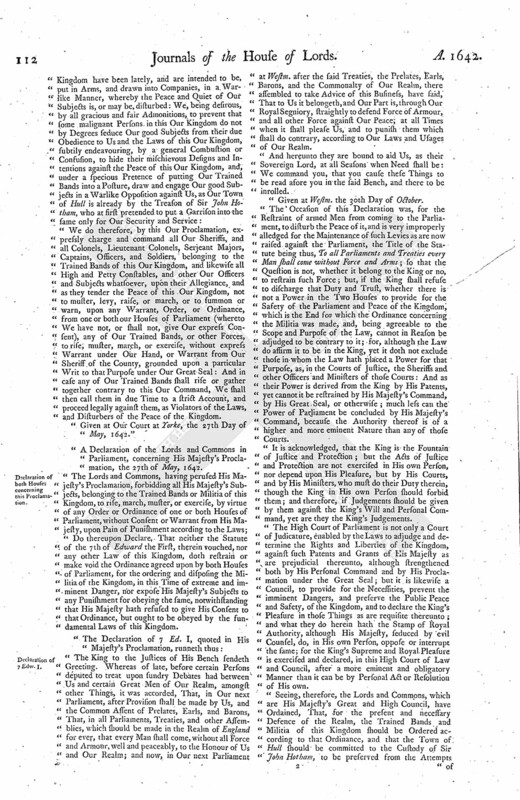 "Do thereupon Declare, That neither the Statute of the 7th of Edward the First, therein vouched, nor any other Law of this Kingdom, doth restrain or make void the Ordinance agreed upon by both Houses of Parliament, for the ordering and disposing the Militia of the Kingdom, in this Time of extreme and imminent Danger, nor expose His Majesty's Subjects to any Punishment for obeying the same, notwithstanding that His Majesty hath refused to give His Consent to that Ordinance, but ought to be obeyed by the fundamental Laws of this Kingdom. "The King to the Justices of His Bench sendeth Greeting. Whereas of late, before certain Persons deputed to treat upon sundry Debates had between Us and certain Great Men of Our Realm, amongst other Things, it was accorded, That, in Our next Parliament, after Provision shall be made by Us, and the Common Assent of Prelates, Earls, and Barons, That, in all Parliaments, Treaties, and other Assemblies, which should be made in the Realm of England for ever, that every Man shall come, without all Force and Armour, well and peaceably, to the Honour of Us and Our Realm; and now, in Our next Parliament at Westm. after the said Treaties, the Prelates, Earls, Barons, and the Commonalty of Our Realm, there assembled to take Advice of this Business, have said, That to Us it belongeth, and Our Part is, through Our Royal Segniory, straightly to defend Force of Armour, and all other Force against Our Peace; at all Times when it shall please Us, and to punish them which shall do contrary, according to Our Laws and Usages of Our Realm. "And hereunto they are bound to aid Us, as their Sovereign Lord, at all Seasons when Need shall be: We command you, that you cause these Things to be read afore you in the said Bench, and there to be inrolled. "Given at Westm. the 30th Day of October. "The Occasion of this Declaration was, for the Restraint of armed Men from coming to the Parliament, to disturb the Peace of it, and is very improperly alledged for the Maintenance of such Levies as are now raised against the Parliament, the Title of the Statute being thus, To all Parliaments and Treaties every Man shall come without Force and Arms; so that the Question is not, whether it belong to the King or no, to restrain such Force; but, if the King shall refuse to discharge that Duty and Trust, whether there is not a Power in the Two Houses to provide for the Safety of the Parliament and Peace of the Kingdom, which is the End for which the Ordinance concerning the Militia was made, and, being agreeable to the Scope and Purpose of the Law, cannot in Reason be adjudged to be contrary to it; for, although the Law do affirm it to be in the King, yet it doth not exclude those in whom the Law hath placed a Power for that Purpose, as, in the Courts of Justice, the Sheriffs and other Officers and Ministers of those Courts: And as their Power is derived from the King by His Patents, yet cannot it be restrained by His Majesty's Command, by His Great Seal, or otherwise; much less can the Power of Parliament be concluded by His Majesty's Command, because the Authority thereof is of a higher and more eminent Nature than any of those Courts. "It is acknowledged, that the King is the Fountain of Justice and Protection; but the Acts of Justice and Protection are not exercised in His own Person, nor depend upon His Pleasure, but by His Courts, and by His Ministers, who must do their Duty therein, though the King in His own Person should forbid them; and therefore, if Judgements should be given by them against the King's Will and Personal Command, yet are they the King's Judgements. "The High Court of Parliament is not only a Court of Judicature, enabled by the Laws to adjudge and determine the Rights and Liberties of the Kingdom, against such Patents and Grants of His Majesty as are prejudicial thereunto, although strengthened both by His Personal Command and by His Proclamation under the Great Seal; but it is likewise a Council, to provide for the Necessities, prevent the imminent Dangers, and preserve the Public Peace and Safety, of the Kingdom, and to declare the King's Pleasure in those Things as are requisite thereunto; and what they do herein hath the Stamp of Royal Authority, although His Majesty, seduced by evil Counsel, do, in His own Person, oppose or interrupt the same; for the King's Supreme and Royal Pleasure is exercised and declared, in this High Court of Law and Council, after a more eminent and obligatory Manner than it can be by Personal Act or Resolution of His own. "Seeing, therefore, the Lords and Commons, which are His Majesty's Great and High Council, have Ordained, That, for the present and necessary Defence of the Realm, the Trained Bands and Militia of this Kingdom should be Ordered according to that Ordinance, and that the Town of Hull should be committed to the Custody of Sir John Hotham, to be preserved from the Attempts of Papists and other malignant Persons, who thereby might put the Kingdom into a Combustion, which is so far from being a Force against the King's Peace, that it is necessary for the keeping and securing thereof, and for that End alone is intended; and all His Majesty's loving Subjects, as well by that Law as by other Laws, are bound to be obedient thereunto; and what they do therein is (according to that Law) to be interpreted to be done in Aid of the King, in Discharge of that Trust which He is tied to perform; and it is so far from being liable to Punishment, that, if they should refuse to do it, or be persuaded by any Commission or Command of His Majesty to do the contrary, they might justly be punished for the same, according to the Laws and Usages of the Realm; for the King, by His Sovereignty, is not enabled to destroy His People, but to protect and defend them; and the High Court of Parliament, and all other His Majesty's Officers and Ministers, ought to be subservient to that Power and Authority, which the Law hath placed in His Majesty to that Purpose, though He Himself, in His own Person, should neglect the same. "Wherefore the Lords and Commons do declare the said Proclamation to be void in Law, and of none Effect; for that, by the Constitution and Policy of this Kingdom, the King by His Proclamation cannot declare the Law contrary to the Judgement and Resolution of any of the Inferior Courts of Justice, much less against the High Court of Parliament; for, if it were admitted that the King, by His Proclamation, may declare a Law, thereby His Proclamations will in Effect become Laws, which would turn to the subverting of the Law of the Land and the Rights and Liberties of the Subjects. "And the Lords and Commons do require and command all Constables, Petty Constables, and all other His Majesty's Officers and Subjects whatsoever, to muster, levy, raise, march, and exercise, or to summon or warn any, upon Warrants from the Lieutenants, Deputy Lieutenants, Captains, or other Officers of the Trained Bands, and all others, according to the said Ordinance of both Houses; and shall not presume to muster, levy, raise, march, or exercise, by virtue of any Commission or other Authority whatsoever, as they will answer the contrary at their Perils; and in their so doing, they do further declare that they shall be protected by the Power and Authority of both Houses of Parliament; and that whosoever shall oppose, question, or hinder them, in the Execution of the said Ordinance, shall be proceeded against as Violators of the Laws, and Disturbers of the Peace of the Kingdom."